Lately I’ve been introduced to a number of board games known collectively as “worker management” games. The main mechanic of these games involves each player’s management of their main game pieces representing workers, family members, tribespeople, etc. With varying combinations of placement and removal of these pieces from the game board, the player gains resources, acquires skills, builds structures or otherwise advances in the varying points systems set up for that particular game. The games usually employ the ability to gain additional workers or lose workers over time. Gaining workers usually involves expending more resources to maintain them but also allows a player the advantage of being able to perform more actions within the game. Lords of Waterdeep and Tzolk’in are worker managment games within fantasy swords-and-sorcery and ancient Mayan contexts, respectively. 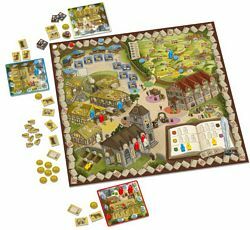 To a lesser extent, Small World is also a worker management game, where players manage successive rising and declining races of varying expertise and strength in a quest to control the board. The latest game I’ve tried within this genre is Village which plays out in a Medieval rural village with each player managing four generations of workers through their lifecycle of birth and eventual passing. Each player begins with their first generation of family members born into the game in their “farmyard” and then deployed to the board. Players can choose to play their pieces in various areas of the board — Crafts, Market, Travel, Church and Council. There are also is also a Harvest area and Family space where new generations fo your family are “born” into the game. Placement in each area can allow a player to gain goods, trade goods for points or otherwise earn points over time. Cubes of four colors as well as pieces representing grain, gold, oxen, horses, plows, wagons and scrolls all serve as tradeable commodities within the game. These are all used in a number of combinations to either acquire different resources or score points. The key to Village is managing the lifespan of your family members, as placement in each area of the board winds up costing passage of life costs marked in a track of hourglasses. Once a certain amount of lifetime passes, a family member dies off and is placed either in the prominent “village chronicle” book or in a generic grave. Timing exactly when your villagers die determines your shorter term acquistion of more goods or resources and long term point score at the game’s end. 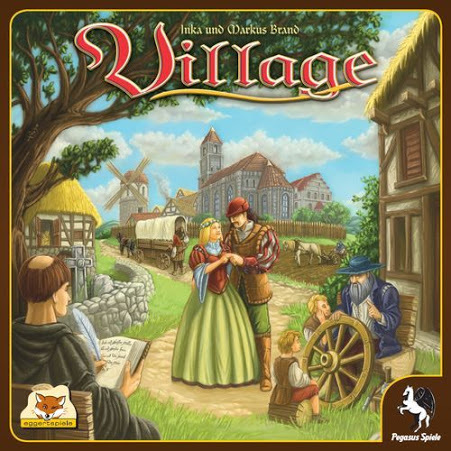 Each round of the game involves a re-set of the village and an interesting “mass” at the church where players have the opportunity to move up in prestige (and score points) through their prominence of placement within the church hierarchy. Like most other worker management games I’ve played, Village is primarily competitive with little to no opportunity for collaboration between players. There’s variety to be had as players can choose to focus on one area of the board over others to rack up points. Players also exercise a certain amount of control of the game’s pace. They can agressively move their generations through their lifecycles and rush the game to quicker finish or they can take their time and focus more on points throughout the game. While I’ve only played two-player versions of the game thus far, I can’t wait to try a three-or-four-person game where compettion for space and prestige on the board will obviously be more competitive. The game moves fast, and in just about 60-90 minutes players can easily cycle through the rise and fall of four generations in this wonderfully imaginative Village.